One of the things I miss the most being on a Paleo/Primal diet is BREAD. In that category would also be a nice, not too thin pizza crust that I have never been able to replicate with cauliflower. I also wanted to be able to PICK UP the slice of pizza and not have to use a utensil. A lot of gluten free pizza recipes require and knife and fork and leave me feeling like I am eating some sort of soggy polenta dish with tomato and cheese on top. PS: You’ll need a food processor, 3 sheet pans (at least 9 by 13) a cook top of some kind, and an oven to make this! (Just throwing that out there!) For the oven, place one rack in the middle and one nearer to the top. 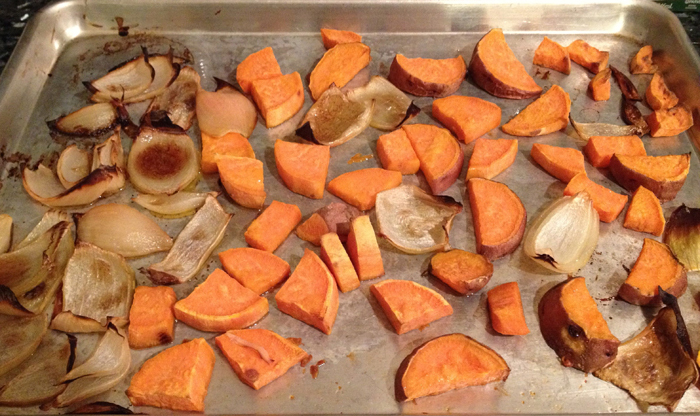 Peel and cut your sweet potatoes into roughly 1-2 inch squares and pre-cook them. You can do this any way you want, but I would stay away from boiling them because this will leave them waterlogged and soggy. My shortcut is the microwave. Cook them until they will mush between your fingers with almost no effort. You can also bake them if you want. Tip: Cook potatoes the night before, or even a few days before to shave a little bit off your pizza prep time. If you are making the breakfast pizza, this is the part where I go ahead and PREHEAT the oven and cook my bacon for the topping at the same time. 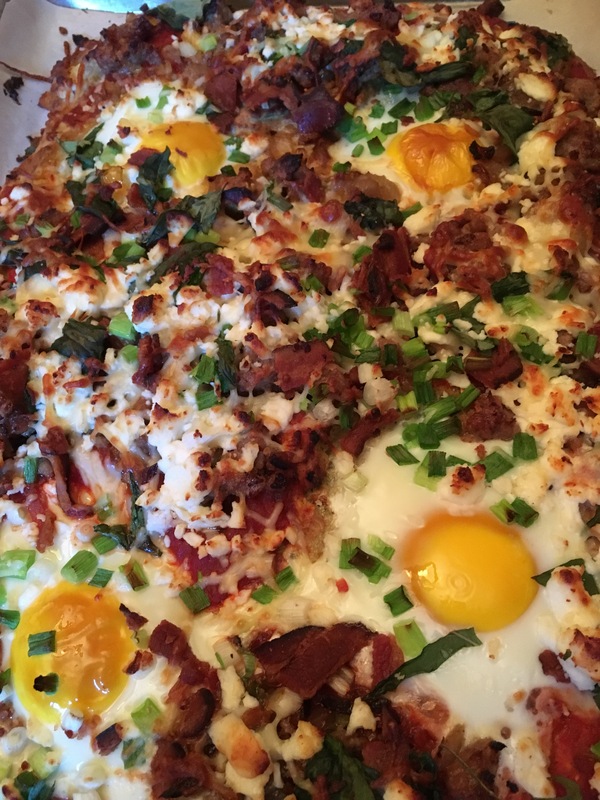 Even if you’re not making the breakfast version, SURELY you’ll want bacon on your pizza anyway! 🙂 This is an easy way to get the bacon super crispy without burning it. I use a sheet pan lined with parchment paper to cook the bacon. While you’re at, go ahead and line THREE sheet pans with parchment paper. Two you will need for the pizza crust, so parchment paper line them and set them aside for now. The remaining pan will get a layer of parchment and then your 6-10 slices of bacon. Don’t crowd the pan too much, or the bacon won’t cook evenly and it won’t render (get crispy). Once you’ve put the bacon on the sheet pan, place it in the oven and THEN turn the oven on. Heat it to 400°F. You’ll want to cook the bacon slow, so a cold oven is OK to begin with. By the time you’re ready to put your crust in the oven, your bacon will be almost ready and your oven will be the temp you need it. Now on to the crust! Grind the nuts of your choice (I used a mixture of pistachios and almonds–1 cup ground pistachios, 1/4 cup ground almonds) until they look like coarse sand/start sticking to the sides of the food processor bowl (we don’t want nut butter, just finely ground). Pulse in your parmesan cheese. Add the salt, garlic powder and the dried oregano. Then begin adding your sweet potatoes in stages. You will need to add the water, olive oil, and 3 eggs in between adding the potato pieces so that the mixture continues to blend well. Depending on the size of the potatoes, you might not need to add all of them. 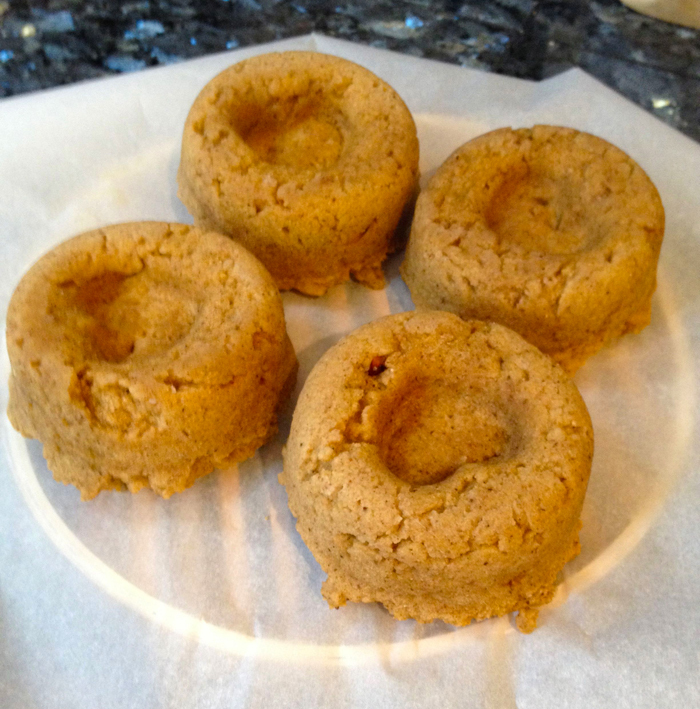 Consistency-wise you are looking for a thin cookie dough, but thick cake batter. It won’t be the consistency of pizza dough from a pizza parlor, it will be more loose than that. Spread the dough mixture onto the other parchment-lined pan. Spread evenly across the pan, no thinner than a 1/2 inch thick. At this time, you can check your bacon. It may or may not be done depending on the thickness of the bacon slices. If it is not done, you can leave it in on the top rack and set the timer to remind you to check it (I go in 5 minute increments). Also, make sure to pour any excess grease off of the pan. Pour the grease into a coffee cup or something you can retrieve it from for later use (I will get to that later!) Place the dough pan on the middle rack and bake for 10-12 minutes. If you want, you can buy a jar of pizza sauce and skip this step all together. I do this when I am pressed for time. If not, add your crushed tomatoes, paste, and herbs and salt to a saucepan and cook together while the pizza crust does it’s first bake for the 10-12 minutes. You will be simmering the sauce until you need to use it. Also, the bacon should be getting done by now, so check it again and take it out if necessary. While the sauce is cooking and crust is baking, dice up the shallots. Then, in another saucepan separate from the one you used for the tomato sauce, pour some of the bacon grease you reserved from earlier, heat it up, and sauté the shallots until they are translucent. Add the ground sausage (turkey or pork, whatever your preference) and cook with the shallots, allowing the meat to cook through and brown. 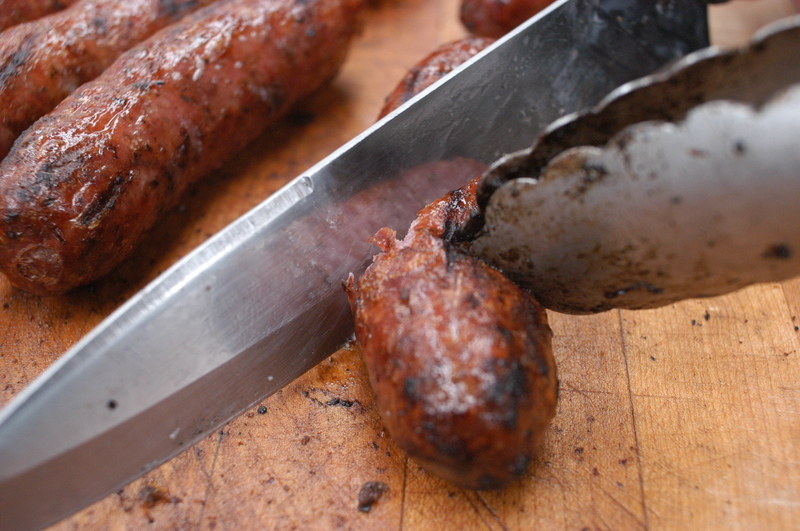 When the meat is browned, turn off the heat and set aside. At this point, the first bake of the crust is probably done, so go ahead and take out the crust and place the pan on a heat safe surface. At this point, fetch the third parchment lined pan, and invert it, making sure the parchment paper stays put. Place it on the top of the crust and flip it over. This is so the pizza crust will cook through/dry out, and you will be able to pick up the pizza/not eat with a fork! Your oven should still be at 400°F. If you are making the breakfast pizza, this is the part where you will peel the parchment off the top of the crust, use the back of a spoon and make little “wells” on the pizza. I make 4 wells for 4 eggs. The wells I am describing are little indentations so that when you crack the egg on the pizza crust, it will not run all over the top. Instead, it will be captured in the little bowl you made for it. Once you have made the wells and cracked the eggs into them, carefully place the crust into the oven for another 10 minutes. This time, use the rack that is higher in the oven, so the eggs will set. Take the crust out (the eggs on top should be almost set). Turn the oven temp up to broil (low), you will need to use the oven one last time after you top the pizza (so that the cheese will melt). Begin with the tomato sauce and spread around the crust, being careful to avoid the eggs on top. Then add the sausage, bacon, sun dried tomatoes, green onions, and top with the mozzarella cheese. You should still be able to see the eggs through the toppings. Place the pizza back in the oven until the cheese on top melts and browns. I like to keep an eye on the pizza through the window on the door of the oven to prevent over-browning. Once the cheese on top is melted, take the pizza out, allow to cool 5-10 minutes before cutting. This is the part where I set the table. By the time I am finished setting the table, the pizza is ready to cut and serve! Did I leave out anything? Do you have questions? Contact me here! 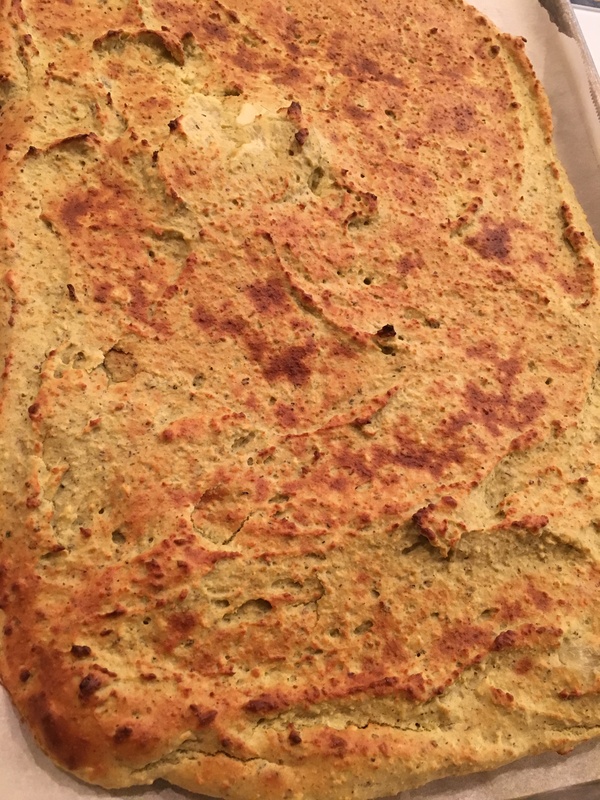 For other adventures in gluten free pizza, you can click here and here. There’s even here. 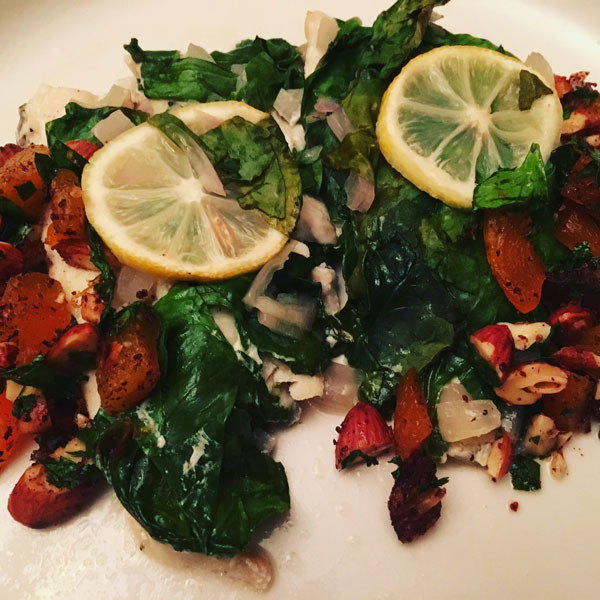 If you’re anything like me, the last thing you want to do when you get home from a busy day at the office is go to the grocery store (after sitting in traffic for almost an hour), wade through the aisles, figure out what to make, shop for the ingredients, wait in the checkout line, then actually COOK a full meal after all of that. Now, if I didn’t work full time with a giant commute, I would be planning out multi-course menus for the week, shopping for the freshest ingredients and taking my time with all the preparations. I would be all about making every night’s dinner an event to remember. But, for most of us, that’s just not a reality. Enter Sun Basket. 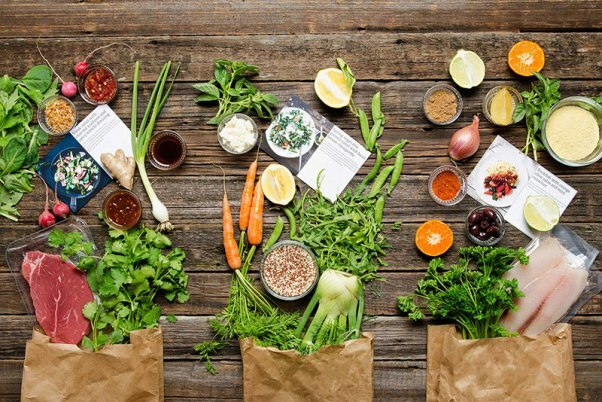 The product that delivers a weekly box equipped with 3 meals for 2-4, and inside the box includes everything you’ll need to make them. With Sun Basket there are easy and delicious recipes that YOU choose weekly for 2 to 4 people at $11.49 per meal. 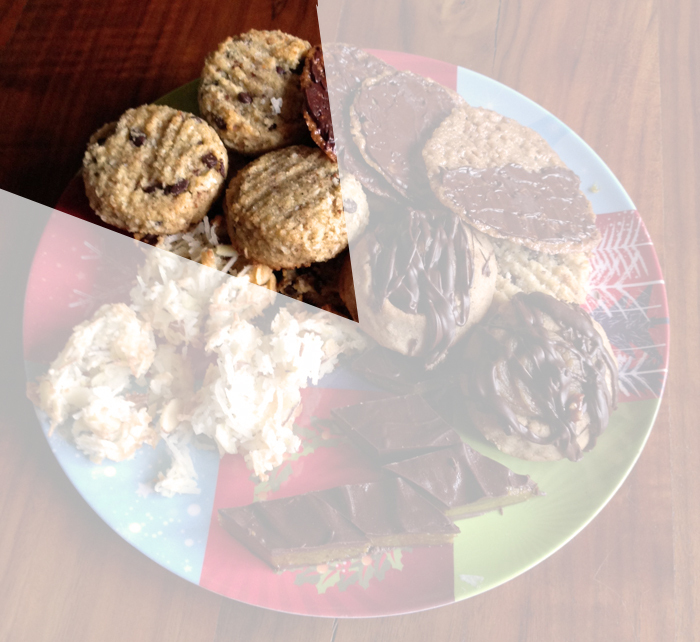 You can customize for a Paleo, gluten-free, or vegetarian diet. 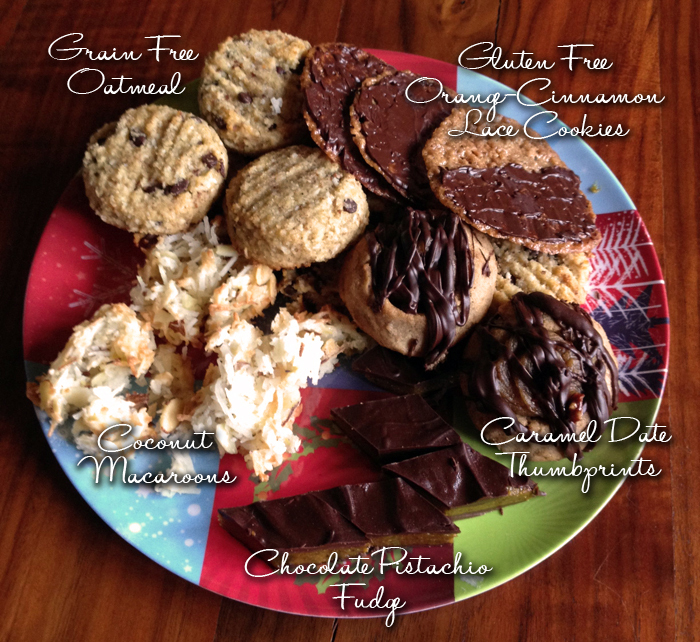 All recipes are created by top San Francisco chef Justine Kelly and approved by a nutritionist. The Sun Basket kits are certified organic and sustainably sourced. All the ingredients are pre-measured which is less hassle and creates less waste. 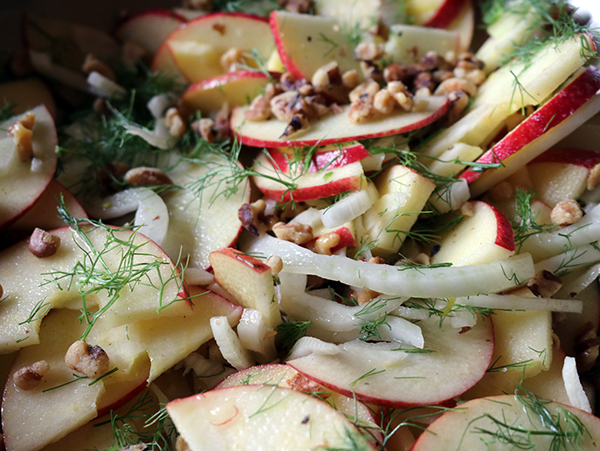 You can feel free to skip the grocery store and enjoy the best seasonal ingredients. 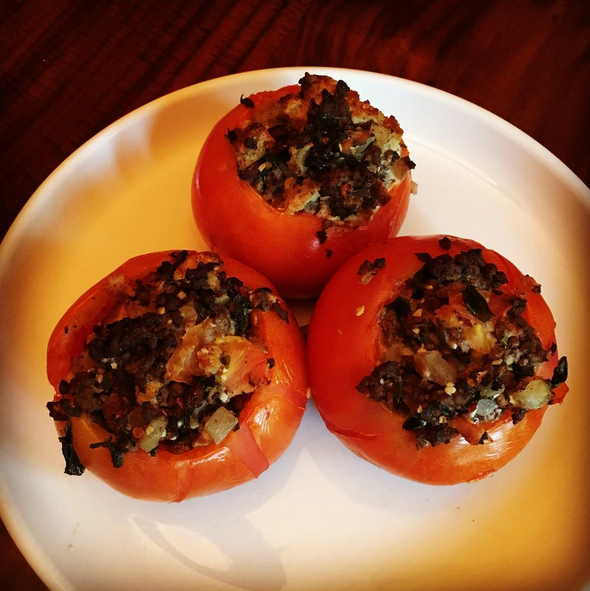 You might even enjoy an ingredient that is hard to find or you have not tried on your own! 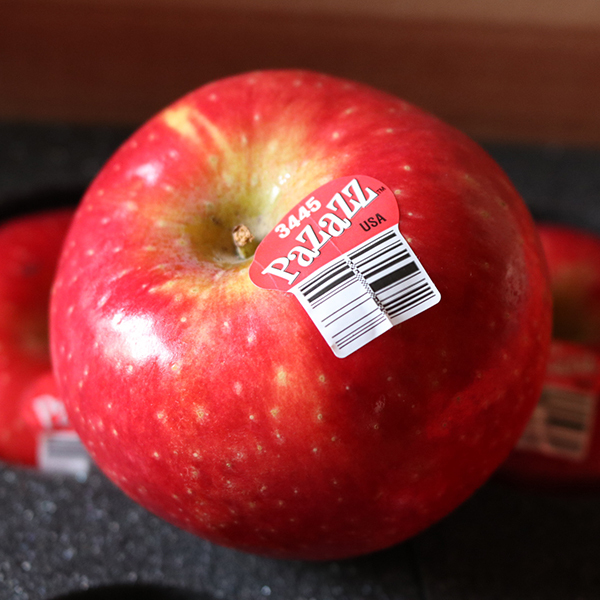 Sun Basket delivers weekly right to your door. 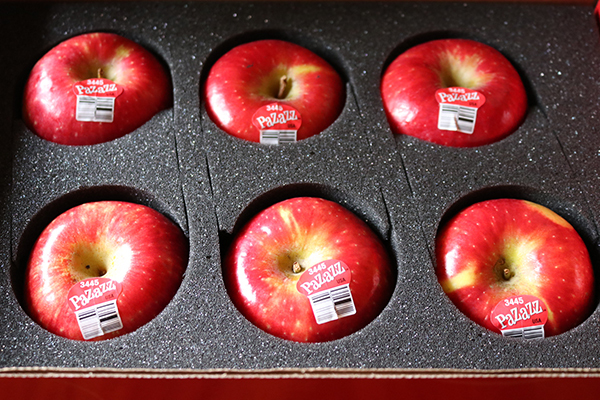 The ingredients are shipped in an insulated box so they stay fresh and the packaging is recyclable and reusable. So what did we enjoy in our Sun Basket? We chose strictly Paleo options for the week and ended up with the 1. 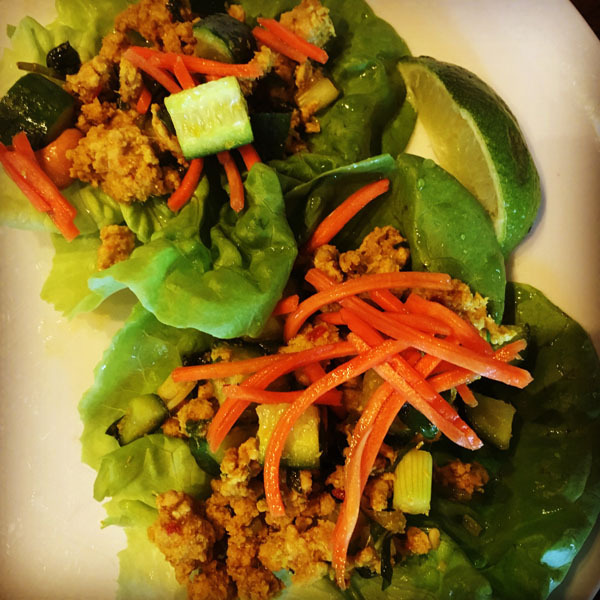 Thai Turkey Lettuce Cups, 2. Steaks with Artichoke-Red Pepper Tapenade and Sweet Potato Fries, and 3. Trout in Parchment with Warm Date and Apricot Salad. Here’s what it all looked like! 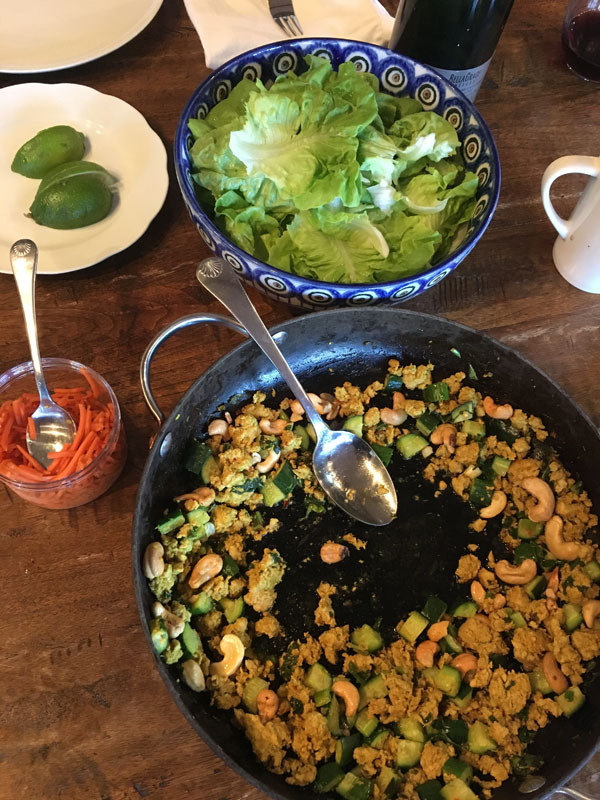 Meal One: Thai Turkey Lettuce Cups, recipe HERE. 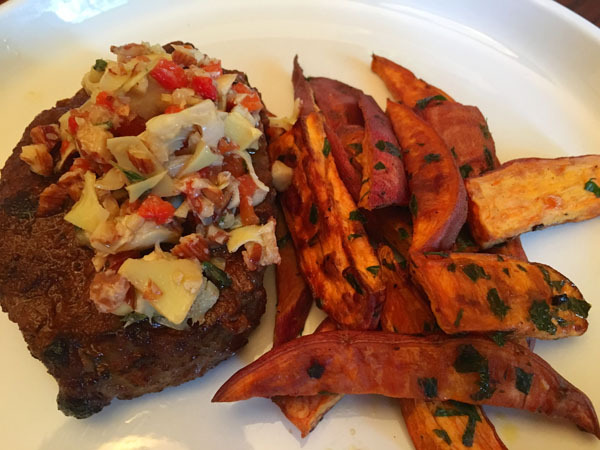 Meal Two: Steaks with Artichoke-Red Pepper Tapenade and Sweet Potato Fries, recipe HERE. And meal three: Trout in Parchment with Warm Date and Apricot Salad, recipe HERE. If you’re a big eater, then perhaps you might choose the 4 person serving to feed 2 people. I like that the calories and nutritional information is all right there on the recipe card, as well as detailed instructions on how to prepare each dish that is in the box. One of the best things about Sun Basket is that you can order when you want and skip when you don’t. There is no commitment to order week after week, but you’ll want to order repeatedly once you discover the convenience and taste of the box contents. You can find Sun Basket on Facebook here and follow them on Twitter here, Pinterest here and on Instagram here. To place an order, you can visit https://www.sunbasket.com/home. 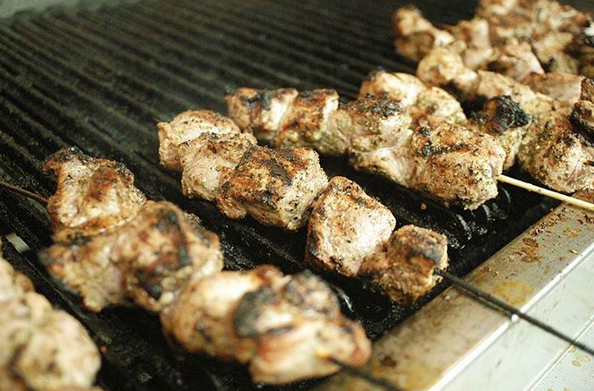 The Sacramento Greek Festival Returns Labor Day Weekend! The Sacramento Greek Festival is back this Labor Day weekend and will be celebrating its 53rd anniversary! 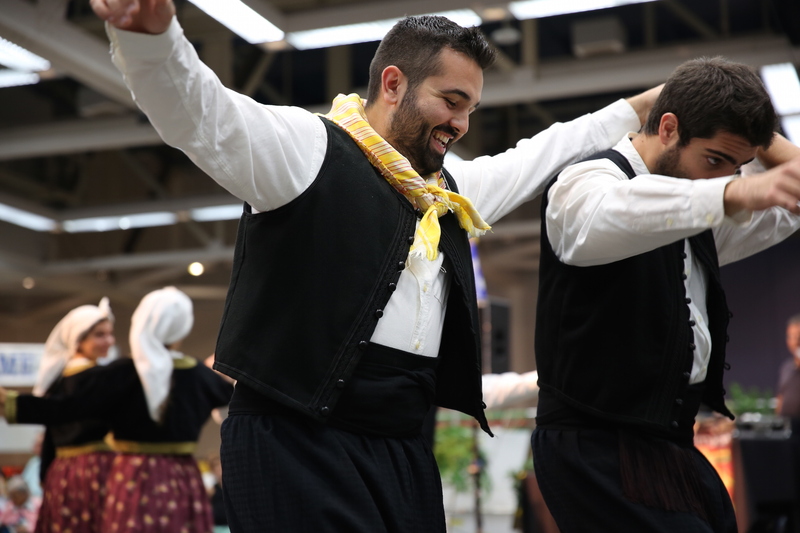 Come experience the culture, traditions and fabulous food of Greece right here in Sacramento. All of the food at the festival is homemade by volunteers and is derived from authentic recipes passed down through generations directly from the Greek Mediterranean. There is a fun and lively village-style atmosphere at the festival which accurately represents the Greek passion for family, life, church, food, drink and dance! Pitas – traditional tiropita (feta) or spanakopita (spinach & feta). 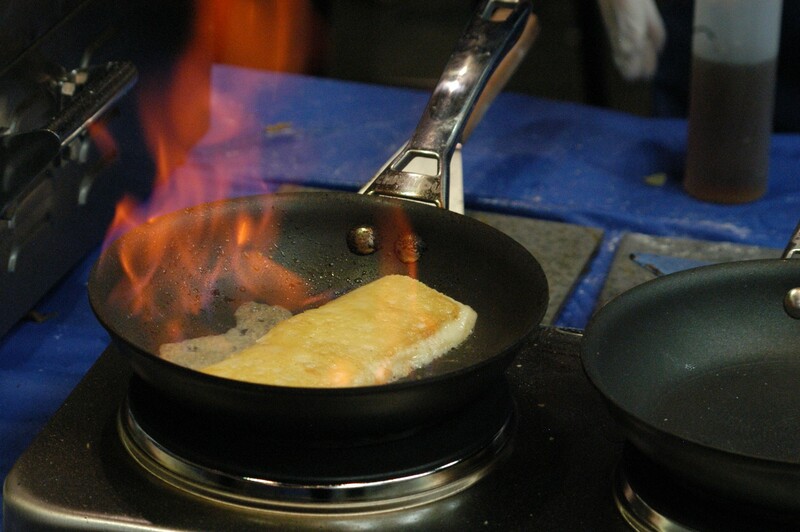 Saganaki – flamed kefalograviera cheese with a hint of lemon and brandy. 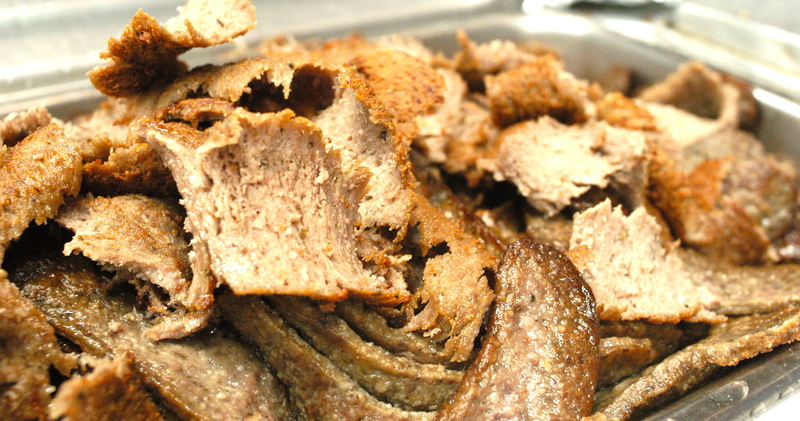 Loukaniko – traditional spiced Greek sausage, served with pita bread. New Loukaniko – sausage with mountain feta and Kalamata olives, served with pita bread. Keftethes – Greek meatballs with tzatziki (cucumber, garlic, and yogurt sauce) and pita bread. Gyro – savory slices of lean beef cradled in pita bread, topped with onions, tomatoes, and tzatziki sauce. Calamari – seasoned strips of crispy fried calamari. Tiropita – cheese puff triangles made with a blend of cheeses, eggs and seasons wrapped in buttered phyllo dough. Pilafi – rice flavored with butter and lemon juice..
Horiatiki Salad – traditional village salad made with fresh veggies, Kalamata olives, feta cheese, olive oil, and seasonings. Moussaka – layers of eggplant and Greek-seasoned ground beef topped with a creamy Bechamel sauce. Shrimp Santorini (Friday only) – shrimp in a tasty sauce with feta cheese and herbs with Pilafi and Fasolakia. Beverages include Kafeneion (Greek Coffee), Greek Wines and Beer, as well as water and soda. A full menu can be viewed here. There are also several activities planned during the festival. There will be live music, dancing lessons, choir presentations, and the famous festival raffle. In addition there will be cooking demos and a few eating contests! For a full schedule of events each day, you can click here! The hours of the festival are as follows: Friday 11am-11pm, Saturday 12pm-11pm, and Sunday 12pm-9pm. You can the Sacramento Greek Festival on the web here, find them on Facebook here, follow them on Twitter here, and catch them on Instagram here. See you at the festival! 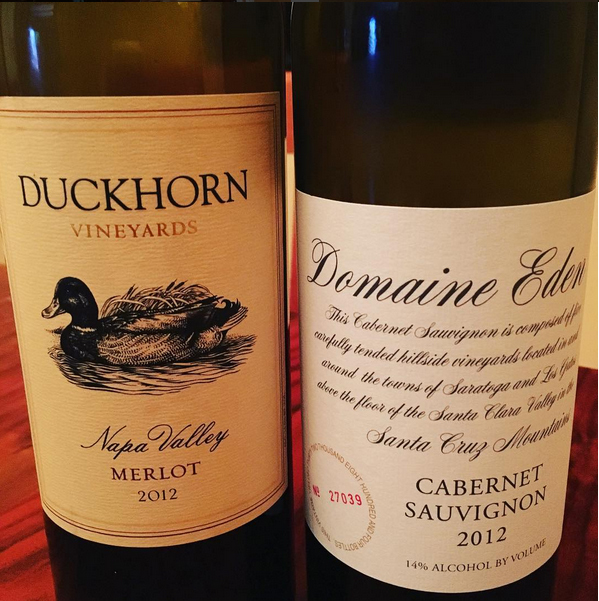 In this edition of Flights By Night, we bring you a classic pairing of pork and Pinot Noir. A bone-in pork chop with an apple and onion sauté and an apple gastrique. Served with roasted Brussels sprouts. 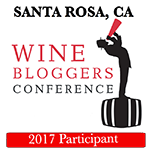 The Pinot Noirs that Andy chose are some of the most delicious Pinot Noirs I have ever tasted and they are very reasonably priced. 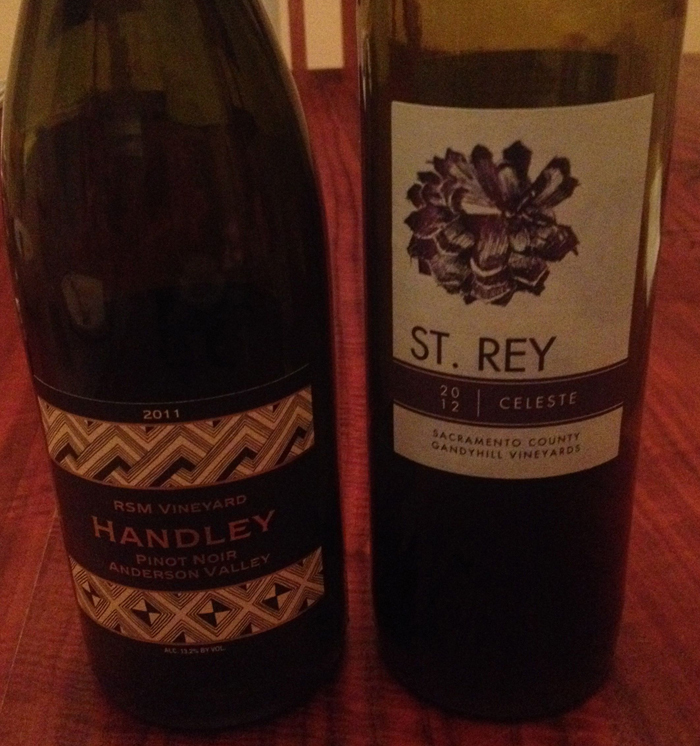 Wine number one is Handley’s 2012 Anderson Valley Pinot Noir (their self-titled “flagship wine”) and wine number two is Talbott’s 2013 Kali Hart Pinot Noir (which is my personal favorite red wine right now, because of it’s drinkability with or without food). 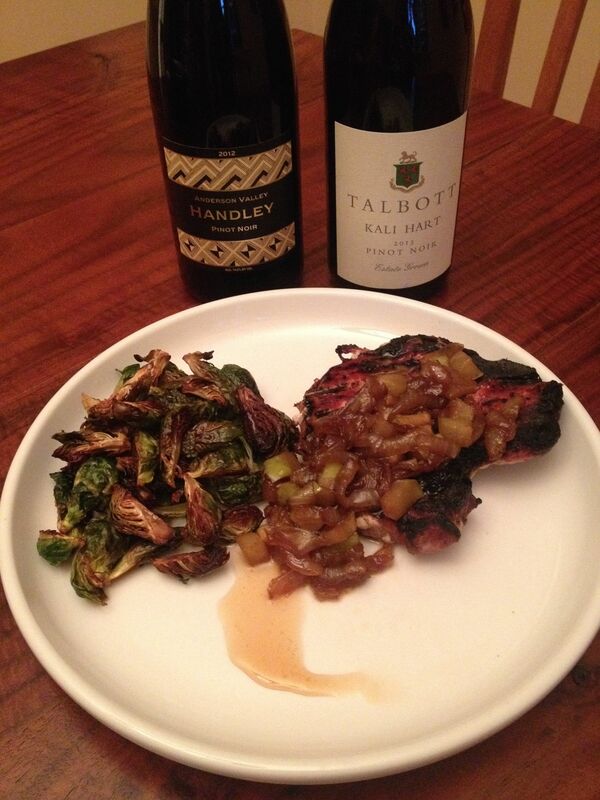 The food pairing was a no-brainer because pork is always a perfect match for Pinot Noir. I quartered the Brussels sprouts and roasted them in olive oil. For the apple and onion sauté, I sliced the onions and cooked them in olive oil, seasoned them with salt, and then added 2 Tbs coconut sugar to help caramelize them. 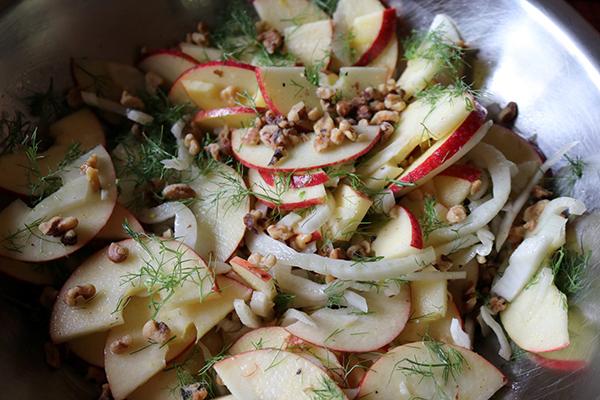 Then I added some chopped apples, and cooked the onions and apples down together until the mixture was browned and thickened. That’s it for today’s Flights By Night! 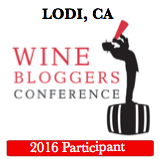 Check back in a few days for another great food and wine pairing! I’m having a lot of fun with the donut mixes I was given by Dr. Bob’s Donuts and DoYos. I’ll be working with Dr. Bob’s in some upcoming blog posts to show you how you can transform their mixes (both blonde and chocolate) into your own unique creations. 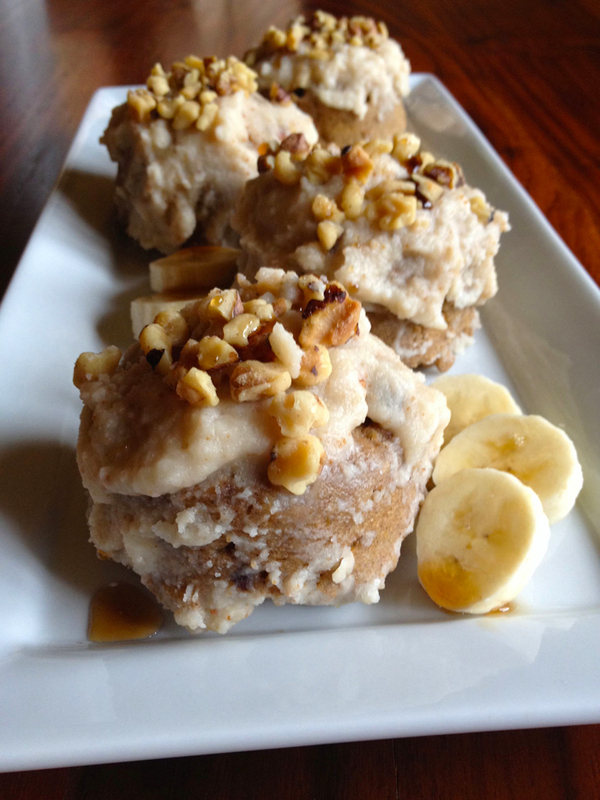 Important: Make the Banana Date Filling and toast the walnuts first, as you will need some of both in the donut batter. Pulse all ingredients together in a food processor until well blended. This will be your filling for the donuts that will go in the little heart indentation in the donuts. For the banana and date “water”, measure about 1/2 cup of the banana and date filling into a measuring cup, and fill with 1/2 cup more room temperature water. Mix well. To make the donuts, stir in the “banana/date water” into the donut mix ingredients and stir until completely incorporated. Divide the batter into the 4 compartments of the Dr. Bob’s silicone pan. (I spray mine with coconut oil spray to make sure the donuts don’t stick to the pan). Microwave the mixture for 2 minutes, then turn out the donuts onto parchment paper, or a parchment paper lined Mandala cooling rack. Now you’re ready to make the maple glaze. Heat coconut oil until it is in a nearly liquid form. 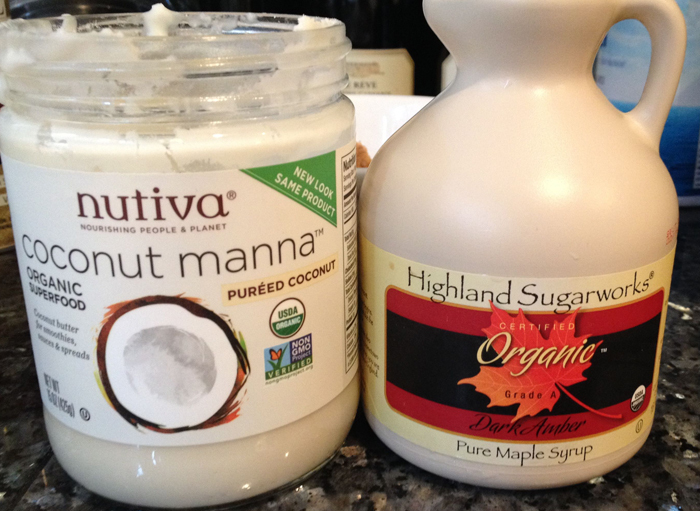 Stir in the maple syrup and the Stevia until well combined. Fill your donut hearts with the banana date filling, then drizzle/ice each donut with the maple glaze. Then top the donut with the remainder of the toasted walnuts. 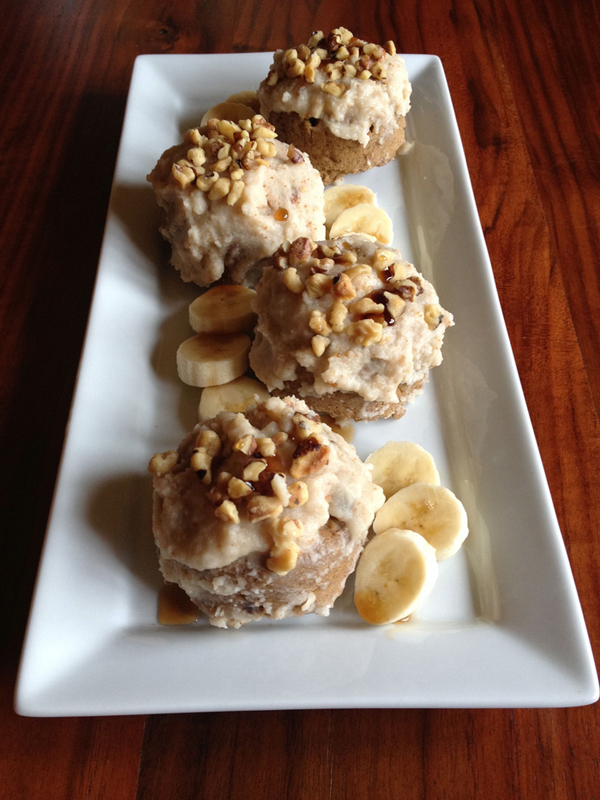 For a dramatic and delicious effect, top the donuts with more maple syrup and serve with banana slices. Prepare 2 half sheet trays by greasing them liberally with olive oil. Chop all vegetables into uniform pieces. 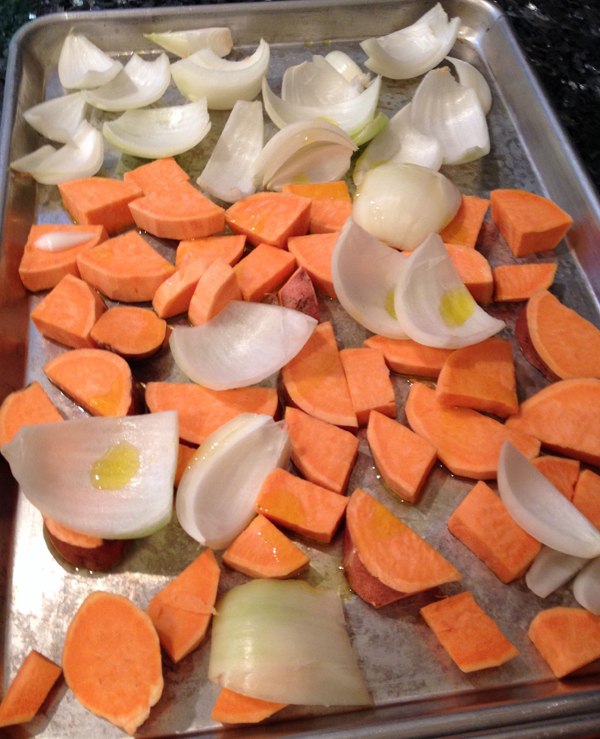 Place the onion and the sweet potato on one tray. On the other tray, you should be able to fit the chopped tomatoes, peppers, garlic and shallot. Important because the potato and onion will take slightly longer to bake. Bake the vegetables in the oven for about 40 minutes, checking to make sure nothing is burning and rotating them on the pan to prevent burning. 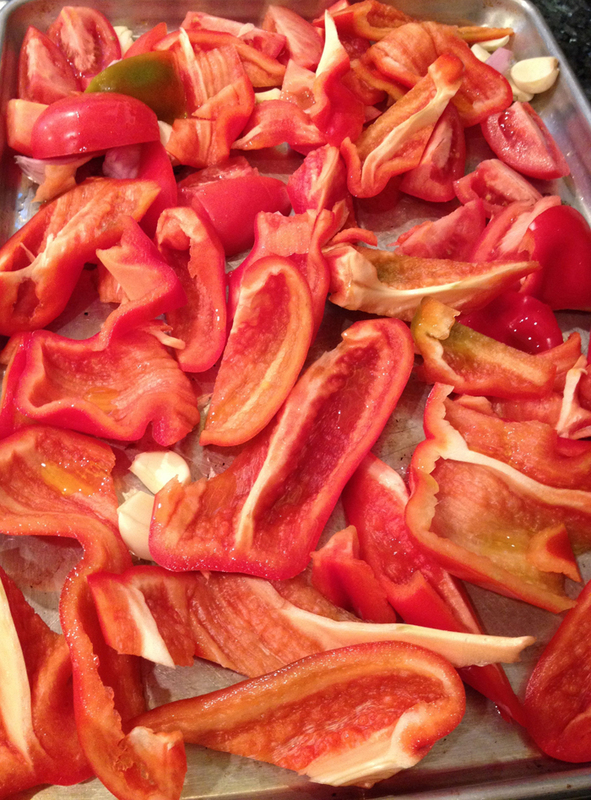 The peppers and tomatoes will be ready to remove from the oven when the peppers blister slightly and the garlic is roasted and tender. 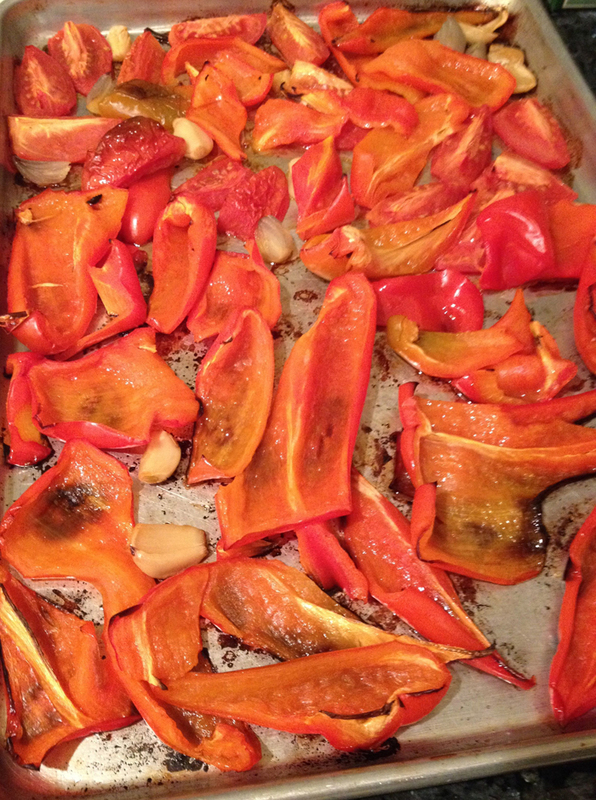 From the time you remove the peppers and tomatoes, leave the potato and onion tray in the oven ten minutes longer. In a blender, begin to blend all the vegetables. There will be more than one blender can hold, so blend a little at a time with the vegetable stock. Since you will be enjoying the soup, add the stock to the consistency you like (I used all but about 1/2 cup of the stock), as thick or as thin. Empty each round of blended vegetables into a very large bowl so that they will mix together. 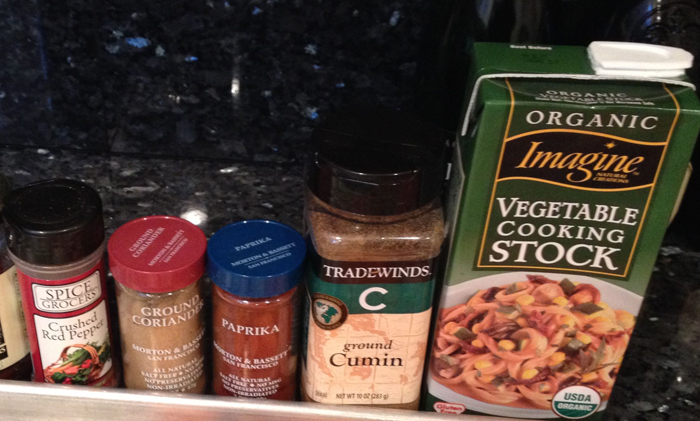 Then add all of your spices and flavorings. The crushed red pepper, paprika, coriander, and the cumin and salt to taste. Stir the spices in the bowl manually. 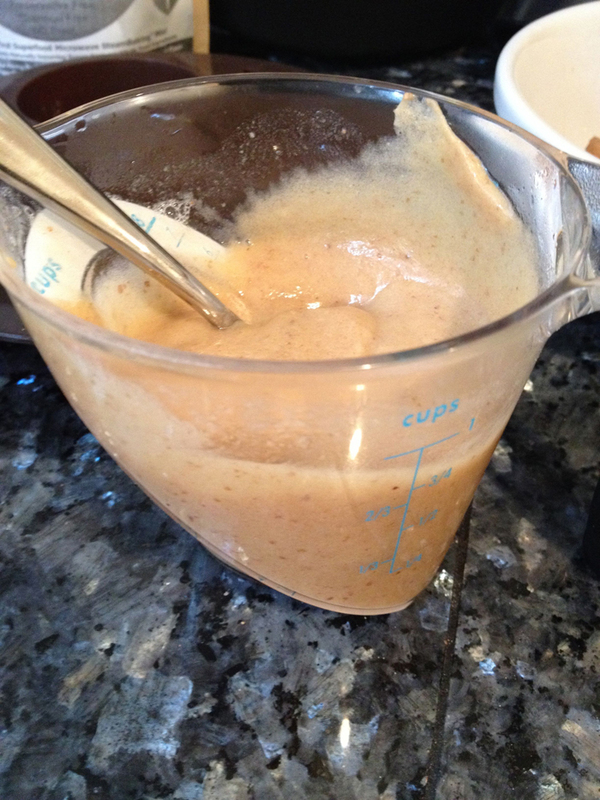 Then in batches, return the vegetable mixture to the blender and mix until completely smooth. Pour the smooth soup into a new large bowl. This soup can be made up to a day ahead of time. Just simply ladle into serving bowls and reheat. 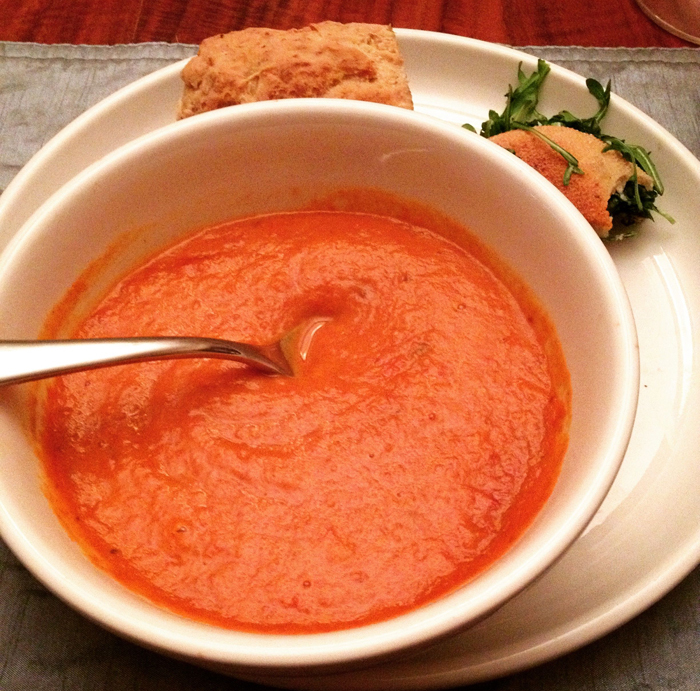 I’m confident this will be one of the easiest, yet most tasty soups you will ever make! 🙂 We paired the soup with a 2011 Handley Pinot Noir, Anderson Valley and a 2012 St. Rey Celeste, Candyhill Vineyards (Revolution Wines). 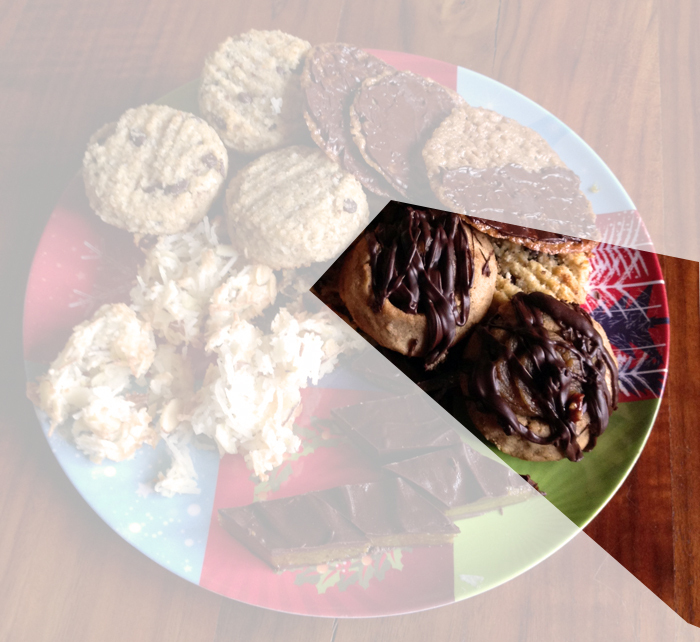 Special thanks to the suppliers of our ingredients for the First Annual Ladies Holiday Party and Gluten Free Cookie Exchange: Challenge Butter and Bob’s Red Mill. As you can see above, our ladies put together quite a spread with your line of products. Place the Challenge Butter and the egg in the bowl of a stand mixer and cream for 1 minute on high. If you don’t have a stand mixer you can use an electric hand mixer. Add the honey and vanilla and mix for another minute. Place the cinnamon, nutmeg, Bob’s Red Mill flours, baking soda, salt, and flax seeds in a small bowl and stir to combine. Preheat the oven to 350°F. 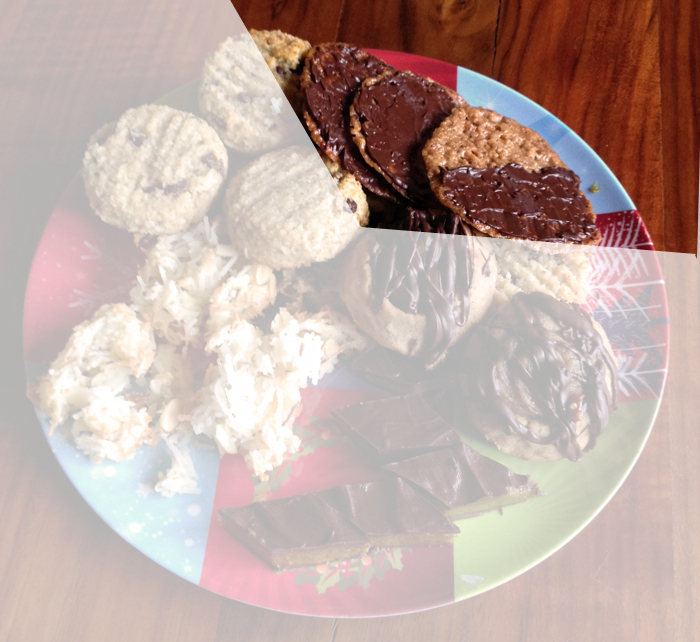 Line two baking sheets with parchment paper or foil. 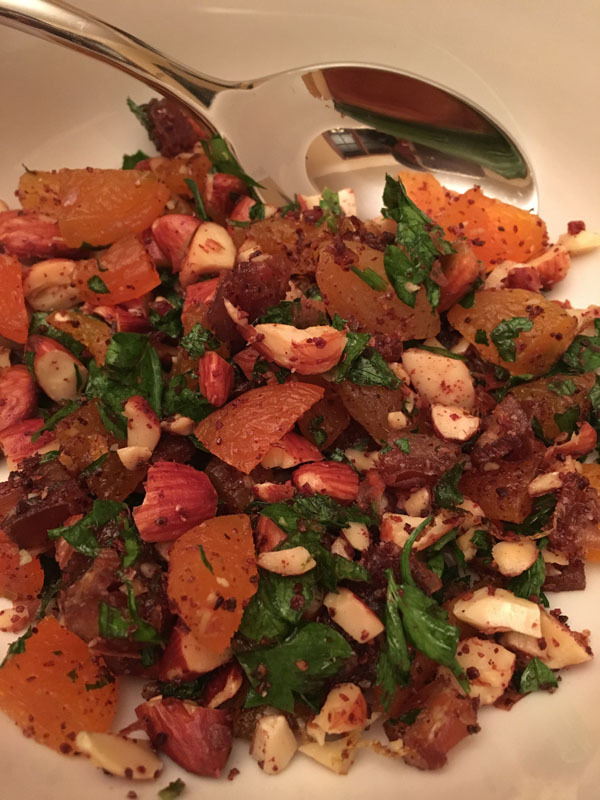 In a small bowl mix together the flours, salt, cinnamon, and orange zest until well blended. Combine the Challenge Butter, Pyure Organic Stevia, and honey in a medium saucepan set over low heat. Stir until the butter melts and the stevia dissolves. Increase the heat to medium and bring just to a boil. Remove the pan from the heat. Stir in the dry ingredients into the pan, followed by the orange extract. Drop the batter onto the prepared baking sheet by teaspoonfuls, spacing the spoonfuls 4″ apart from one another. Bake no more than six cookies on a pan. Bake the cookies for 7 to 9 minutes, until they’re an even golden brown. Transfer the cookies, on their parchment or foil, to a rack, and let them rest until they’re completely cool and crisp. Bake succeeding batches while the first batch is cooling. 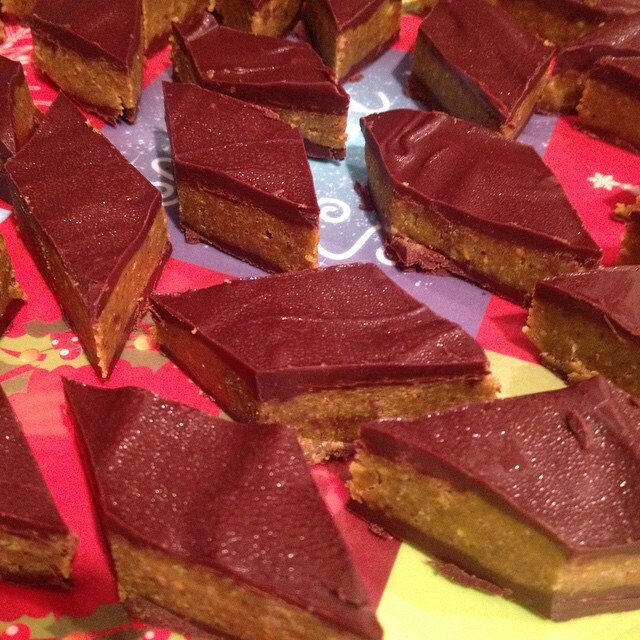 Once the cookies are completely cool, drizzle them with melted dark chocolate, if desired. Pulse all ingredients together in a food processor. Remove dough from food processor and wrap in plastic wrap. Chill for at least an hour to firm up the dough. You can also place in the freezer for 10-15 minutes to speed up the process. Shape cookies into little balls and press your thumb into them to make a deep impression. Bake at 350°F until they are golden brown. Take out the cookies and carefully (as the cookies are still hot) press them back down in the center to make sure the impressions are deep enough to hold the caramel date filling. 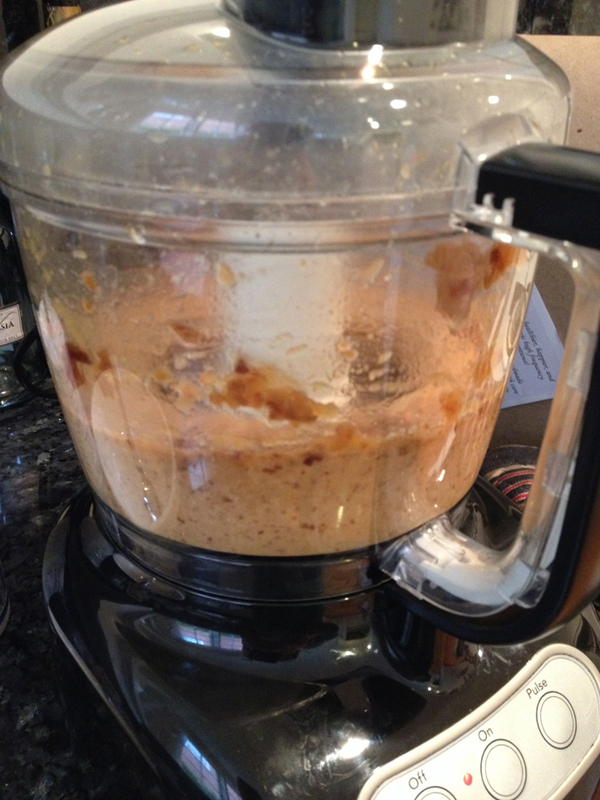 Pulse in a food processor until the filling becomes a caramel texture. When cookies have cooled, use a pastry bag to fill them with the caramel. Melt the chocolate and the coconut oil in the microwave in 20 second bursts, stirring in between. 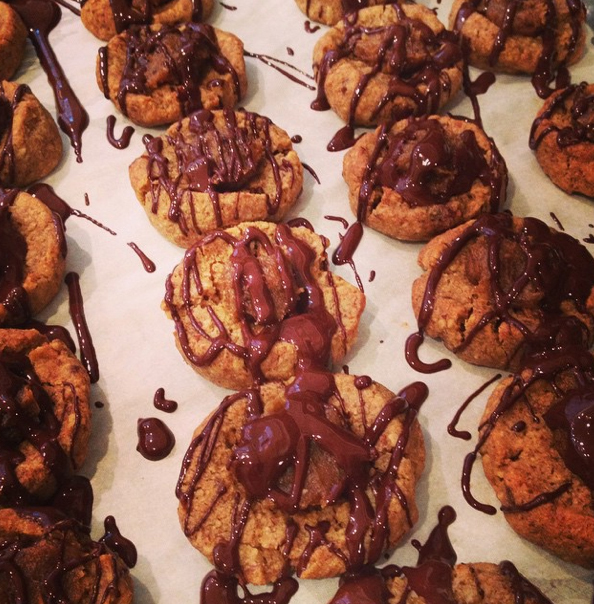 When chocolate is melted, drizzle it over the finished cookies and set aside to dry. Thanks again to Challenge Butter and Bob’s Red Mill for their awesome product supplies. You can find them on Facebook here and follow them on Twitter here. You can find Bob’s Red Mill on Facebook here and follow them on Twitter here.